There seem to be many similarities between pizza, focaccia and ciabatta. Apart from one obvious similarity which is ‘they’re all Italian bread, they have the same dough consistency with the same hydration (water to flour ratio). They are all rustic and somewhat lean bread (with or without olive oil in them). Some of the cookbook also used the same recipe to produce these three breads and shape them differently. I bake pizza often but hardly make focaccia. This was only the second time I made them. I used Peter Reinhart’s recipe from American Pie . The dough is prepared a day before and baked the next day. The recipe and process is somewhat similar to his pizza recipe in Bread Baker’s Apprentice . It called for cold water and overnight retardation straight after the mixing. The dough was relatively easy to mix by hand (I did this in a bowl with wet hands). The dough came together and the gluten was developed quickly, which I believe resulted from high level of water in the dough. Kneading dough with olive oil by hand was enjoyable. My hands and the dough were so soft and supple as a result. From time to time, I had trouble shaping pizzas to the desired shape, size and thinness. The trouble also extended to transferring the pizza from bench to the baking stone. Making focaccia eliminates these issues as the dough is shaped and baked in trays or pans. Focaccia and pizza are similar in more ways than one. You can use the same dough to make focaccia or pizza. Toppings also work interchangeably between the two. I also adjusted the recipe a little by including 200 g of sourdough starter and reduce the amount of yeast by half (from 1.5 % to 0.75% in term of Baker’s Percentage). I made pure sourdough pizza before. Though it tasted great, it wasn’t as light as I wanted. In my opinion, the sourdough starter didn’t have enough power to rise against the topping. I decided to include both starter and yeast in this recipe for both flavour and rising ability. Herb oil or oil are infused into focaccia during shaping. The herb oil I used was a mixture of garlic, rosemary and tarragon (both are the only herbs from my garden that still survive the winter). The herb oil smelt fantastic when baked and lift the flavour of focaccia tremendously. The focaccia was tasty and crusty. I made this focaccia when S’ mom was over for lunch. It was served with pea and ham soup. Though it didn’t sound typical to have focaccia with soup, it worked extremely well. 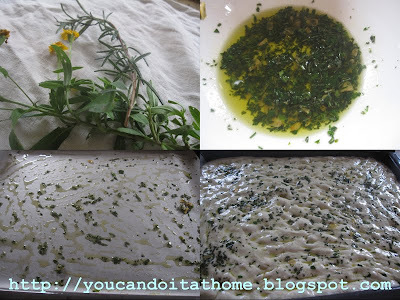 For focaccia recipe that I used, you can find it here. I followed the recipe without using the potato topping part. sue, you're really good and i'm learning so much from you! not yet posted on my blog tho! Thanks Ceren. I love Turkish bread too. Do you make them? haha not really? You mean pide? yeah I like it but the stores sell it everywhere so haha..
Is pide similar to pita bread? Turkish bread is more like focaccia without any topping. It is nice with dips and sandwiches. The picture is in the link.... I think this could be another like Singapore noodle, a well known dish in Australia that doesn't exist in Singapore, lol.